Eugene Matthias - Professional Funeral Celebrant - Eugene Matthias is an Funeral Celebrant. He has been trained to the highest level by The Fellowship of Professional Celebrants, in partnership with the UK College of Celebrants. My name is Eugene Matthias, I am a professionally trained Independent Funeral Celebrant conducting Funeral Ceremonies and Memorial services in Buckinghamshire and Bedfordshire. I have been trained to the highest level by The Fellowship of Professional Celebrants, I am also a professional Toastmaster, and Fellow of the Executive Guild of Toastmasters. I am proud to have received the 'Freedom of the City of London' for my work with charity. ​As your Celebrant I will support you and your family in their time of need. I am fully experienced in writing and officiating bespoke Funeral Ceremonies which can include Music, Readings, Poems and Prayers. I work closely with your funeral director to make the service a special one for you and everyone attending. A family visit to arrange the funeral service. Personally written ceremony script which is meaningful, celebratory and sympathetic. After the service I will give the funeral service in a presentation folder. ​For more information on my services visit the About Me page. I would like to sincerely thank you for the part you played in my step fathers John Passes funeral last Wednesday. We were all very deeply touched and moved by your kind words and humour. This could of been a very sad day but instead we found ourselves celebrating Johns life. You really did listened to Linda and myself, so you were able to get the eulogy spot on, finding little thing to mention so everyone felt included. Thanks so much for following up since last week's funeral. I speak on behalf of my brother and sister to say the service you delivered was a wonderfully fitting tribute to our Dad and there were many moments that made us smile and think of better times with him. You wrote the eulogy really well and it really captured Dads essence. You also managed the service seamlessly even with the impromptu Hindu flower scattering! You really understood our family dynamics and I think this was reflected in what you wrote and did on the day. Overall we were just so impressed from meeting you to your quick responses with the drafts and incorporating any changes we made. Lastly on the day for putting us at ease, you helped to make things so much easier during what I can only describe as a surreal two weeks. We had some lovely comments from friends and family about the service you did, one even commented that it was the best funeral service she had been to, so that says to me we did celebrate Dads life. On a personal note I do hope our paths cross again under better circumstances. If I ever marry I will definitely be giving you a call! I would not hesitate to recommend you to anyone I know. Glen and I want to thank you for Mum's lovely send off. I was a bit concerned about having the service so organised, so often such organisation can lead to a cold and unemotional arrangement. This was not the case, not only was the service thoroughly well organised, but it was warm and emotional, unlike my father's funeral. Thank you so much for the wonderful service you did for us. We have had so many comments from people who thought the funeral was lovely, and it did celebrate her life, as you intended. You made it a very special day for us. Thank you for your service, which was very good. It was at the right tempo and temperament throughout and everyone said it was a lovely service. One thing I thought was great was when the grandchildren went up and put things on the coffin. Although you didn’t say anything in your service, it was your idea and I think it gave another dynamic to the informal service that our Mum would have wanted. Thank you for suggesting this. Thanks for all your help and assistance in this difficult time. I would like to thank you so much, on behalf of my family, for the really lovely service you conducted for my Father. There were so many words of praise for this celebration of Dad's life and times. I was so glad I was able to read the Poem, which came from my heart. Richard and Jane were brilliant and many many thanks for the way you told everyone about Dad's life. A very fitting finale to such a long life. ​A Funeral Celebrant is a person who is specifically trained and certified to meet the needs of families during their time of loss. 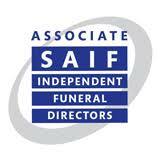 They serve by providing a personalised funeral service to reflect the personality and the lifestyle of the deceased. I pride myself on being able to provide a personally written ceremony script, which is meaningful, celebratory, sympathetic, and altogether honourable in representing the deceased and their grieving family. For many years, families were only offered the option of a religious funeral in a church, or the fully atheist alternative of a Humanist ceremony. However, as an Independent Celebrant I offer the option to involve your personal faith and beliefs when saying farewell; whether religious, non religious, spiritual or uncertain. Today you have a choice to celebrate the life of a loved one, and mourn the passing of their spirit, in a way which is appropriate, personal and special to you. I am not affiliated to any religious order or spiritual faith, and am all encompassing in helping you to plan a funeral ceremony which is reflective of your own lifestyle and choices. I will dedicate my time and work closely to you and your family to help write and officiate a funeral ceremony which gives dignity and personality to the person who has passed away, and allows family and friends to grieve in a way which is right for them. Based in Bedford I can provide services as a professional Independent Funeral Celebrant in the surrounding areas of Bedfordshire and Buckinghamshire.